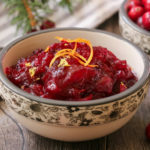 This EASY Gluten Free & Vegan Cranberry Sauce Recipe is perfect for all of your Holiday dishes. It’s All Natural, Delicious & can be prepared in advance. 1/4 Cup Fresh Orange Juice (or Juice from approx. 1 Orange) – You can also add some zest from an orange if you prefer a stronger orange flavor. In a Medium sized pot add Cranberries, Orange Juice, Sugar, Brown Sugar, Cinnamon & Water & mix together well. Bring Mixture to boil over medium heat until mixture begins to thicken and the cranberries start to pop. Stir Regularly to prevent mixture from burning. Removed from heat and allow to cool completely. Store leftovers in airtight container in fridge.